What’s the deal with Ryan Lavarnway? Ryan Lavarnway was once the favourite son in Boston. Once primed to inherit full-time catching duties from Jarrod Saltalamacchia, Lavarnway now appears to be somewhere around fifth or sixth on the depth chart. He’s probably the first (or maybe third) line of defence if the club were to need a spot start. So what went wrong? Frankly, I don’t know that this is an answerable question, but heck, I’ll give it a go. Lavarnway’s 2011 season was something to dream on. The then-23-year-old mashed, hitting a combined 34 homers in 547 trips to the plate across both the Major Leagues and Triple-A. Since then, Lavarnway has been a shadow of himself, hitting only 14 home runs across all levels in 2012 and 2013 combined. We might be willing to forgive some offensive shortcomings if he could really handle himself behind the plate, a la Christian Vazquez, but we all know that he can’t. Okay, sure Lavarnway has come miles from where he was at the start of his career, even being named best defensive catcher in the International League during the 2012 season. No one is really sure of what his skills are at the Major League level though, because his performance has never afforded him more than the smallest taste of big league action. If we look back at the 2013 season, a year in which David Ross spent a fair amount of time on the shelf, we see that Lavarnway appeared in 25 games for the Red Sox. Now, you dont have to subscribe to Catcher’s ERA (CERA), I myself find it dubious, but I also think that it is an intriguing and fun way to quantify a catcher’s relationship with his battery mate. Ryan Lavarnway put together a 4.62 CERA for the 2013 Boston Red Sox; nearly a full run higher than Jarrod Saltalamacchia, who was not exactly a defensive gem. David Ross meanwhile, in only 36 games, paced the club with a 3.12 CERA. Now, it’s a small sample, and small samples mean next to nothing, and small samples of CERA probably mean even less, but it still shows that pitchers weren’t producing with Lavarnway behind the dish. After the completion of the World Series, I remember David Ross speaking about how hard he had to work, and how mentally taxing it was for him to prepare for and work through each and every game. Ross isnt exactly a premier +.300-type of hitter but I can’t help but wonder if Ross loses a step at the plate because of how taxing his work behind it is. Does Lavarnway have that same issue, if there’s an issue at all? 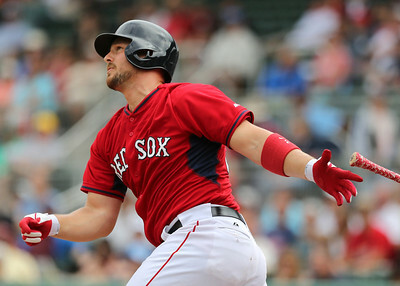 Lavarnway, if his 2013 Major League numbers are anything to go by, has still demonstrated an ability to hit for average and draw the occasional walk (.299/.329/.429 in 82 plate appearances). But with only one home run in the Majors in 2013, I wonder if he is mentally over-worked that both his power and his abilities behind the plate are suffering. Lavarnway has drawn himself into a nifty little catch-22, needing more playing to prove he can be an impact with the bat, but also needing to show that he can have an impact with the bat to be granted more playing time. And now, after years of needing to improve upon his defensive short comings to back up his offensive skill set, Lavarnway finds himself devoid of either skill. And it could not have come at a worse time for the 26-year-old as Boston possesses a wealth of quality catching option in the high minors, all of whom have either surpassed Lavarnway or are heavily breathing down his neck. Blake Swihart is perhaps the best of the bunch, but in only his first season at Double-A is unlikely to be ahead of Lavarnway at present, even though his ceiling is that much higher. No, the two guys ahead of Lavarnway, Dan Butler and the aforementioned Christian Vazquez are now that much more likely to replace one of Boston’s starters should the need arise. And so, forced away from catcher, Lavarnway has attempted to establish himself as a serviceable first base option. This move was likely the brain child of two schools of thought on the former Yale Bulldog. Firstly, the more positions he plays, the more viable of a trade candidate he becomes and the more the Red Sox could look to receive for him. Second, the Red Sox have five catcher on their 40-man roster, an unsustainable number in the long run, so moving Lavarnway to first allows for some, albeit not much, positional flexibility should any of their starters go down. It’s probably high time to trade Lavarnway though, as he will likely never be able to flourish in Boston. For the second year running, the Sox went out and signed a veteran to short term deal, therein expressing their lack of faith in the young catcher. At this point, with the arrivals of one or both of Vazquez and Swihart looming, Lavarnway needs to be moved to a team that can give him real playing time at both first base and catcher, in an effort to develop his bat. But for now, his window to become Boston’s full time catcher is likely closed.